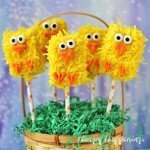 Store bought rice krispie treats dipped in white chocolate and coated in bright yellow colored coconut are transformed into cute fuzzy chicks for Easter. Place coconut in a zip top bag. Add a few drops of yellow food coloring and shake to coat. Dip tip of a lollipop stick into the yellow candy melts then insert into one end of a rice krispie treat. Slide a paper straw over the stick. Repeat with all 6 treats. Allow the candy coating to dry then one at a time dip the rice krispies treats into the yellow candy coating and immediately sprinkle yellow colored coconut all over the treat. Freeze for about 5 minutes until the candy coating hardens. Melt orange candy melts then pour into a squeeze bottle or zip top bag. Pipe an orange beak and two feet onto each chick. Dab some orange candy coating onto the back of the candy eyes and attach two above the beak on each chick. Freeze for a few minutes until the orange candy hardens.